Dynegy Midwest Generation has applied to the Illinois EPA for Section 401 Water Quality Certification for impacts associated with a massive riverbank stabilization project on the Middle Fork of the Vermilion River. Dynegy's project will harm the river. We believe it is intended to allow the coal ash to be permanently left in place. Coal ash chemicals are leaching through riverbanks into groundwater and the river. Coal ash can contain heavy metals, such as arsenic; mercury; cadmium; chromium; selenium; aluminum; antimony; barium; beryllium; boron; copper; lead; manganese; molybdenum; nickel; vanadium; and zinc. These have been shown to cause birth defects, cancer, and neurological damage in humans - and can harm and kill wildlife, especially fish. It's Our River. Let's Protect It! 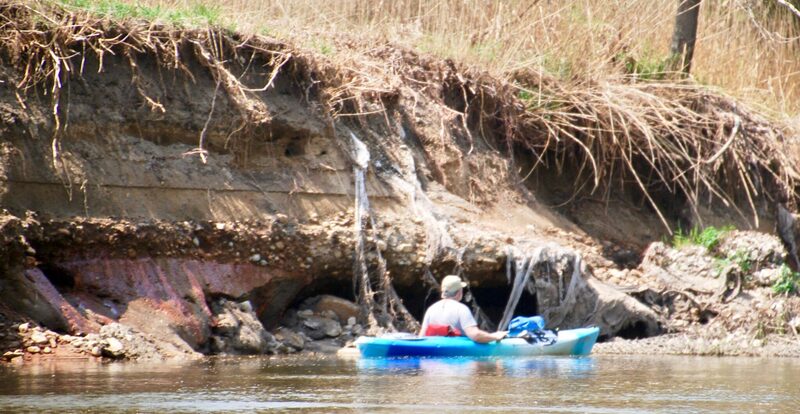 This massive project will forever leave a visual scar on the otherwise natural river corridor; degrade water quality; and have devastating economic consequences for the operator of the canoe and kayak livery in Kickapoo State Park. And it won't do anything to stop the coal ash chemicals from leaching into the groundwater from these unlined pits or leaching through the banks directly into the Middle Fork. In the meantime, riverbanks have been left unprotected, while Dynegy pursues permits to build its wall and agencies determine whether or not they will allow Dynegy to cap its pits, armor its banks, and leave the ash in place; or require Dynegy to remove the toxic material and place it into a properly designed and monitored landfill, far from the river and its floodplain. On March 26, the Illinois EPA held a public hearing in Danville. The purpose of this hearing was to solicit input on Dynegy's riverbank stabilization plan as it relates to water quality and river use. Nearly 300 people attended, and over 50 signed up to testify! If you were not able to attend, you can still make the case for protecting the river by writing a letter to the Illinois EPA, using the form below. Comments will be sent to Hearing Officer Dean Studer. They are due on April 25, 2019 at 11:59pm. Feel free to draw upon the resources and talking points provided in the right column. The link to the talking points provides more detail related to impacts on water quality and recreation, as well as limitations of the Section 401 process. Select one or two points and write about them using your own words, rather than copying them into the form below. The Illinois EPA has said that they will not accept form letters that include the same or similar comments. You must specify Dynegy Midwest Generation 401 or COE 2018-602 in the subject line of your letter. Enter your comments in the text box above. It will expand to accommodate the length of your letter. The Middle Fork of the Vermilion is one of the most vibrant and ecologically-diverse in the Midwest, and has a regional recreational draw that boosts local economies. It is also Illinois' National Scenic River. But Dynegy proposes to build a 1/3-mile long wall using over 22,000 cubic yards of rip-rap (jagged rock) and other fill that would extend over 30 feet into the river channel next to its two oldest ash pit, creating a permanent visual scar. No stabilization will protect these ash pits - in perpetuity - from the meandering river that is moving west towards the coal ash. Gabions (wire cages with rock) installed by Illinois Power to protect these ash pits have been ripped away by the powerful forces of the Middle Fork, leaving riverbanks exposed and vulnerable once again. Excavation of riverbanks and the riverbed (up to a depth of 8 feet) could send contaminated soils downstream, with potential impacts to state-endangered mussels and host fish. Heavy equipment would operate directly in the river, and the construction zone would extend up to 70 feet into the channel. This would require closing the river during prime recreation months or creating a 1/3 mile-long portage around the construction zone. Kayakers or canoeists who miss the portage would find themselves precariously close to heavy equipment and active construction. Gabions installed to protect riverbanks next to thel ash pits have bee ripped away by the force of the river, exposing views of coal ash contaminants seeping into the river. Photo by Pam Richart, Eco-Justice Collaborative. While Dynegy’s alternatives, submitted as part of their Water Quality Certification, range from “No Action” to “River Relocation”, their analyses fail to identify the removal of their toxic waste as an alternative. Relocating the coal ash would minimize the impact on recreational and commercial use of the river; preserve and enhance its ecological function; and best achieve the goal of the project which is to protect the Middle Fork from the risks associated with having 3 million cubic yards of coal waste in its floodplain. Why hasn't this been considered? Dynegy applied for a joint Section 404 / 401 Permit last July. It is likely it will take several months before agencies have all required submittals, conduct a through evaluation of the project, and determine whether or not they will approve this massive riverbank stabilization. But riverbanks need interim stabilization now, to protect them from frequent storm events. A less damaging stabilization project could protect the Middle Fork from a coal ash spill while the Illinois EPA determines whether or not they will require removal of this toxic waste. If the ash is moved, there will be no need for this massive stabilization project. The recent merger of Dynegy and Vistra, two Texas-based power producers, has created a company that now has - according to their own reporting - a net worth of $20 billion. Shouldn’t the utility be held responsible for cleaning up its mess? Stockholders accepted this risk when they bought the abandoned plant and its ash. It’s not fair to the taxpayers who will inherit the liability when Dynegy ultimately leaves. The Middle Fork is Illinois' only National Scenic River. Illinois EPA, we ask you to withhold approval of Dynegy's Section 401 Water Quality Certification and instead, tell Dynegy to install temporary protection where riverbanks are most vulnerable, and move its ash!